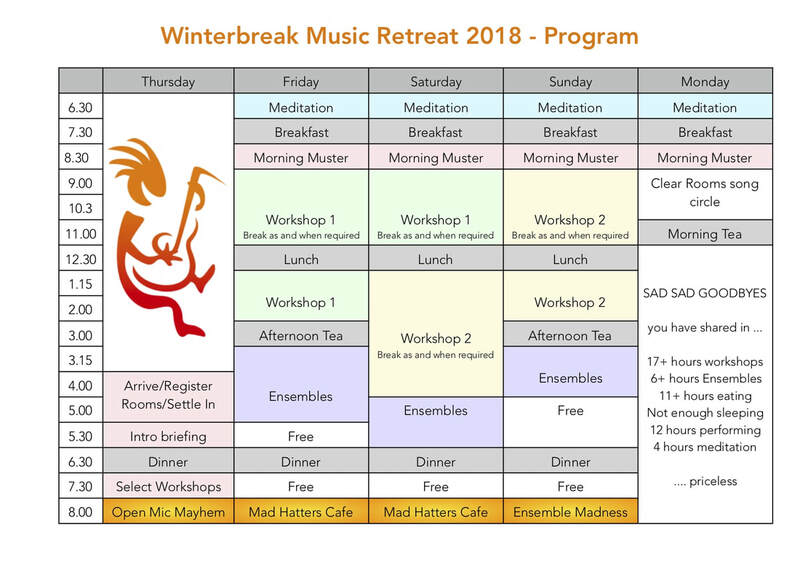 Now in it's 9th year, the Winterbreak Music Retreat gives you and a small number of supportive like minded participants (up to 25 places) the opportunity to indulge your music passion with 5 days of singing, songwriting and guitar workshops led by internationally acclaimed tutor/artists and solo and group performance opportunities. You will share nightly performance opportunities, ensembles, taster workshops, collaborations, meditation for musicians and much much more. Set in glorious North Mount Tamborine in the Gold Coast hinterland an area that also offers you great walks with spectacular cliffs, rainforest and waterfalls. You will stay in “motel style” units. Each with two bedrooms an ensuite and lounge area. There will be no more than 3 to a room (usually only 2). Units are carpeted, heated, TV and microwave. You will need to provide your own bedding/sleeping bag and pillow. The venue (QCCC North Mount Tamborine) has their own chef, meals have been great year after year. Special diets are catered for and all day fruit, tea/coffee is available. Please note: the venue is alcohol and drug free. A songwriter, proficient with a wide range of instruments, and dedicated to uniting folk song tradition with today’s stories, Jon has an uncanny ability to press his ear against the heartbeat and the soul of the times we live in. Though Jon Brooks’ music is filled with grey and morally ambiguous characters living on the outskirts of approval, his mandate is unequivocal: “I’m not interested in ‘happy songs’ – they have a place and purpose and I respect that and there’s many songwriters out there doing that without my help. I’m trying to write healing songs and, for that reason, I’m obliged to reveal a wound or two now and then. I’m even less interested in writing unhappy songs: I want to write hopeful songs, inspiring songs, I believe I owe today’s listener some hopeful argument – some good reason - as to why we should believe our present world could be improved, or healed. The most amazing guitarist ? in the vein of Leo Kottke, Ry Cooder and John Fahey. "At times mesmerising, playful humorous, and wistful, Gilewitz is a master of moods when he speaks to his audience through his guitar. He is always at the service of his inner voice, which has a sneaky way of connecting directly to the listener's heart." Creative Loafing Magazine,Tampa BayFL Florida based Richard Gilewitz is today, acknowledged as one of the most unique and humorous performers on the contemporary acoustic scene, he is respected worldwide for his command of the 6 and 12-string guitar. In workshops, he is the player's answer to overcoming common frustrations while increasing fingerstyle techniques, overcoming fears and insecurities, rekindling the passion for learning new guitar pieces, and rediscovering the joy of guitar! For the beginner and advance player. ​One of my favourite early memories of connecting with music was attending a folk music night with my mum and hearing a singer perform a beautiful rendition of The Streets of London. I was transfixed. The memory is vivid, though over twenty years have passed; I have never forgotten the power and beauty of that solitary voice. She has released an EP – This Way (2008) and an Album – Yesterday’s Blues (2012). Both received nation wide airplay and are distributed globally. She has toured Australia, Japan and London with her music and performs regularly with her original music project and also her corporate band Elegance Jazz. She is currently working on a new recording. Winterbreak's Sound Doctor - Michael manages quality sound for your Winterbreak performances but offers so much more. Today Michael runs a spacious recording studio on a lovely farm in Peachester in the Glasshouse Mountains and also the Glasshouse Musos - a popular open mic session which (encourages original artists) and is held 4 times a month. His PA experience includes 15 years of weekly house gigs, concert halls and festivals. Along with PA and recording, today he occasionally performs (on a range of instruments, but mainly as a keyboardist), mentors performing artists, builds web sites and makes the occasional music video. In an earlier life he was a full time composer writing operas and orchestral pieces (for 15 years), spent 8 years in academia teaching composition, arranging and music technology, and directed festivals and ran a concert giving music organisation in North Queensland (6 years). At Winterbreak Michael is very happy to assist people with their arrangements and writing skills, the technology they are using, their PA interests, their recording and or video making interests. My love for photography began from the moment I got my first camera. I was about nine years old and that little Hanimex camera was my favourite companion. I’ve always been a quiet observer and keen people watcher which I believe are great assets for my photography. Some of my favourite photos are the ones taken candidly that capture a beautiful expression or interaction between people. A few years ago I returned to university to further my studies n digital photography and video, graduating with a Masters in Digital Design. Currently I’m working towards creating my own business providing multimedia services. Having been a professional musician for over twenty years I understand the importance of having decent promotional material. I’m very excited to be returning to Winterbreak again this year to capture the magical moments and share the music and laughter. Marguerita Vorobioff is a Mindset Mentor and Master Sound Healer. Her passion is to help raise awareness and consciousness through the power of sound. Marguerita trained as an opera singer for 15 years before discovering her ability to raise peoples consciousness and help them heal through the power of her voice. Now she is a healing channel and uses her voice to help people reconnect with their true divinity and power through sound healing and a variety of other powerful energy techniques.